Are you a satisfied customer of Guida? Then, don’t keep us a secret… Refer us to your neighbors and you will be rewarded! As a customer of Guida, we ask that you share your satisfaction with friends & family, and in turn you will receive the "credit" you deserve! So, in an effort to acknowledge you as a valued customer, we've created an exciting Referral Rewards Program as a way to say "Thank You" to our valued customers. Tell your Friends & Family about the quality work and services you received from Guida Door & Window and you could earn a $50 Visa Gift Card! To start, simply fill out your information below along with any friend or relative that may be interested in completing a home improvement project this year. 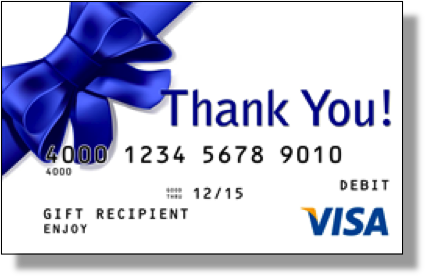 You will earn a $50 Visa Gift Card for every person you refer to Guida who purchases products from us. And when your referral's project is completed and final payment has been received, you get PAID! Plus, there's no limit to the number of referral rewards you can earn. We truly appreciate you as a customer of Guida, and hope to serve you again in the future. Please fill out the following form and start earning your rewards! In order to qualify for the $50 Referral Rewards Card, the referring party must have purchased installed products from Guida previously and be located in our database. To confirm you are a previous customer of Guida's, you must obtain a "Referral Code" from Guida. This will be received via letter/email, or by contacting our office. The referred party must make a purchase. The reward payment will be processed once the referred party's job has been installed and paid in full. Only one referral rewards compensation per paid transaction. ALL PRIOR SALES EXCLUDED. Must request reward redemption within 6 months of install date.